Great leadership is grossly misunderstood. It is not that there is not enough knowledge about leadership: books, articles and seminars abound. There is just little understanding about what really makes leaders great. The first aspect of greatness was discussed in Drawing #1:Who Leaders Should Be. (https://www.linkedin.com/pulse/leadership-series-pictures-drawing-1-doug-wilson?trk=prof-post). Without the character illustrated there, nothing else matters. Building on that foundational character base is a second aspect of great leadership illustrated in the drawing below. At first glance, this picture is no different from a thousand other illustrations. But there is a major difference. Great leaders lead differently by doing the same things other leaders do but doing them differently. To build greatness in leadership, most people concentrate on the boxes. As important as the boxes are, that is not where success resides. Great leadership lies, not in the boxes, but in the arrows connecting the boxes. Greatness comes from the way in which each box interacts with and energizes the other boxes. It is what makes the sum of the whole greater than the sum of the parts. Just as a row of car parts lying in a garage does not make a car, neither does attending a series of seminars teaching various leadership techniques produce a great leader. Today there is a concern over the availability of future talent, especially leadership talent. Many companies have expressed concern that they do not have a sufficient number of leaders to meet future demand. (In a study completed by Right Management, only 13% of companies indicated they believe they have ample leadership talent to cover their future needs). So companies go to great lengths to identify and train future leaders. However, the lack of understanding about how great leaders lead permeates the way leadership development efforts are designed. Most management development courses teach skills in “buckets” or topics: learn goal setting in this hour, learn communication in the next hour, and learn coaching, ad infinitum. •	43% of respondents say management-training programs “plug holes” and deal with short-term problems rather than long-term strategic objectives. •	82% “don’t believe their manager development sustainment” has been successful. •	69% don’t feel their leadership sees an extremely strong linkage between effective manager training and business performance. Unfortunately, leaders do not live in a world where the issues they face match the buckets of training they receive. Great leaders function in a world where all skills must be integrated around a common issue or opportunity to create value. It is the ability to apply and integrate key leadership skills that produces maximum value and success. It involves developing the power illustrated by the arrows linking the leadership tasks. (And please note that every box on the chart is connected to every other box; the interrelationships are multiple and complex; but this is where richness in leadership occurs). An additional insight is that all areas are interconnected through one dimension – people, who are at the center of everything a leader does (or does not do). Take the leadership task of engagement. Today many vendors are selling the latest and greatest engagement techniques. Companies that use these services are often unsatisfied with the results because they ring hollow and are met with leader and employee skepticism. Once tried and failed, the technique will be tossed on the trash heap of leadership fads as another academic idea that did not work (been there, tried that; (except not really!)). •	Leadership guides and directs be setting an expectation of excellence, and supports be defining what excellence looks like. •	Evaluation (feedback) is provided information that helps the individual and group produce meaningful work and grow professionally. Bottom line: There is a significant interplay between all of the elements but that interconnectedness is not being emphasized. This leads to significant problems. As a result many leaders approach leadership techniques as a series of items to which they need to be exposed. Once a class has been attended, that item can be marked off a mandatory leadership development “to do” list. When enough boxes are checked off, these leaders believe greatness should result. Consequently, boxes are checked but the concepts that are presented are placed on the shelf never to be used again unless and until the leader recognizes a specific opportunity where that skill is needed. The result? We are producing educated mediocre leaders and that is very dangerous because leaders begin to believe they are great when they are not. They can talk the talk but they do not know how to apply what they have learned. Leadership development is big business but the business is to make money for leadership development gurus, not to produce great leaders. And like lemmings we follow the latest leadership concepts over the cliff, never stopping to think about the arrows (how these new concepts fit in to other leadership activities). Suggestion: Take a look at the agenda for the next leadership development training conducted in your company. If it reads like a list of the latest and greatest management techniques and never addresses the arrows, cancel the contract immediately. 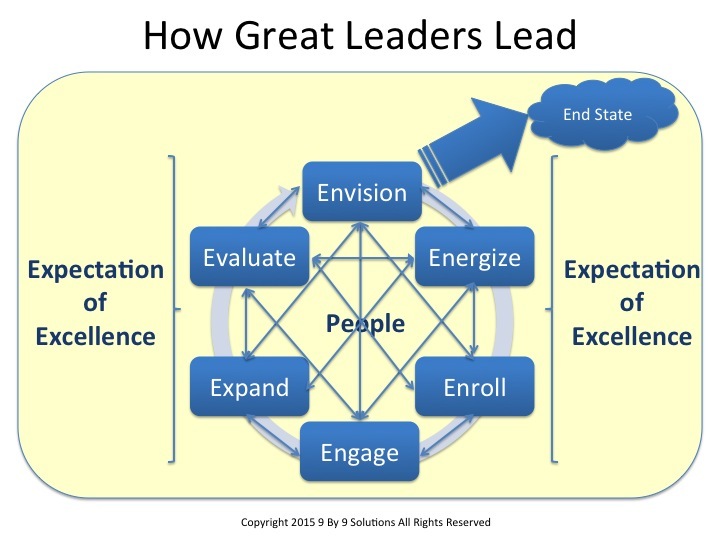 What other thoughts do you have after reviewing the picture of how great leaders lead?